Build your project right with quality, safe electrical and plumbing supplies from trusted brands that last. Avoid unnecessary waiting and problems by using the best supplies for concrete, paint, and our range of tools. Those projects are going to require energy. Check out our grocery, prepared food, and livestock feed to get everything you need. 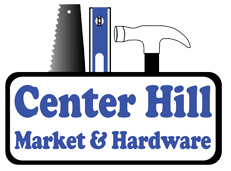 Count on Center Hill Market & Hardware to provide all your need. Our variety store in Killen, Alabama, has hardware, groceries, construction supplies, and even gas to ensure you only need to make one trip. Conveniently located between Lexington and Greenhill, we make it easy to start an at-home project, pick up a pizza for dinner, and gas up the car on your way home. We have paint, plumbing, feed, grocery, and gas all in one place for the ultimate in shopping convenience. You'll enjoy a wide variety of products to meet all of your needs, and the stability of a local business that has served customers for more than 25 years. Center Hill Market & Hardware is a member of the Shoals Chamber of Commerce, and dedicated to meeting the needs of all of our customers and the communities we serve. Monday – Friday, 5:30 a.m. – 5:30 p.m.
Saturday, 6:00 a.m. – 5:30 p.m.
Sunday, 7:00 a.m. – 5:30 p.m.